Many people are confused about using images in ezines, products or on their website that are captured from the web. I purchase most of my images from IStock, or other resources, but what are the clear cut rules? I know Constant Contact offers free images as well as Microsoft clipart. And when writing about a product or resource (basically promoting them), is it safe to use a picture of the product or company logo? I've done this before. You can get yourself into trouble by using images, can't you? Even if you don't see a "copyright" on them? I would assume that you can ask for permission and cite the image source. Could you could give advice to all those building their business about this? Thank you. Answer: Great question! I have a colleague that just got into trouble with this exact scenario for using an image without permission for her ezine that was copyrighted by a photographer. Copyright protection begins the moment an original work is created and lasts for the creator's life plus 70 years. Copyright protection extends to literature, music, plays, choreography, pictures, graphics, sculptures, architecture, movies, audiovisuals and recordings. So you are correct that images and photos are included and given copyright protection. Copyright infringement is using someone else's creative work without authorization or compensation, if compensation is appropriate. So, what we are dealing with here is a potential copyright infringement of someone else's photo or image. (It may also be a trademark infringement if the image or logo is trademarked.) The owner of the copyrighted material controls whether others can reproduce the work, prepare derivative work, distribute copies or display it. Using it without permission, even if you credit the creator, is not acceptable. Neither is copying others' original work that does not carry a copyright symbol. However, there are exceptions. One is "public domain." But, don't misinterpret the term "public domain." Just because it is on the internet, does not mean it is public domain! Once a copyright expires, it enters the public domain. Public domain comprises all works that are no longer protected or never were, including works created prior to 1923, and works created between 1923 and 1963 on which copyright registrations were not renewed. Works created since 1989 are presumptively protected, and all government material, such as statutes and laws. There is also a Fair Use Exception to copyright infringement that allows the limited use of copyrighted material without acquiring permission from the rights holder. It is permitted for literary criticism, comment, news, reporting, teaching, scholarship, and research. The courts use a four-factor balancing test to determine if fair use exception applies: 1) Purpose and character of use, 2) nature of use, 3) amount and substantiality of work used, and 4) effect on market value of work. Some people believe there is a 5th factor too that depends on the type of infringer (non-profit or for-profit) and its intentions and track record (a repeat offender or an unknowing and unintentional infringer). The easiest way to avoid copyright infringement is to only use images from sources that specifically grant permission, some of which you listed, such as IStock. There is also a non-profit organization called Creative Commons that grants copyright permissions through a tiered approach ranging from selective protection to unlimited grant of permission. You can learn more at www.creativecommons.org. Be sure to look for a Creative Commons License on a website to see if the owner has specified which rights he or she is retaining, and which rights he or she is willing to release. Another way to avoid copyright infringement is to ask to use the work. Sending a simple email request to use an image takes just a few minutes, and can save you a lot of turmoil (and potential legal fees!) in the long run. Approach people online on sites like Flickr. Let them know you'd like to use one of their images, which one, for what purpose, and offer to give them credit. Also, check Stock Exchange and Wiki Commons. Read through the restrictions and rights. Artists will usually list whether a photo may be used, for what purpose, and what type of credit must be given. Despite all of the above, if you are using an official image of a product to promote it, the assumption is usually that the owner of that product is happy to have you assist in their marketing efforts. It has become common practice to use an image of a product when reviewing it, sharing it with your readers, and promoting it for people to purchase. Most companies that put a photo of their products on the internet are thrilled if you take that image and tell the world about that product. It is like having a global sales team! Indeed, if you are an affiliate of a product, there is an implied agreement for you to be able to use the images of that product in order to fully promote it as an affiliate. I often review products on my blog, and the companies that I do so for are only too happy to provide me with images. The bottom line: When in doubt, use images that specifically grant permission. If you are unsure, do not use the image! Seek permission first or find a different image that is clearly permissible to use. Copyright © 2011 Lisa Montanaro of LM Organizing Solutions, LLC. You can, as long as you use this complete statement: Copyright 2011. Lisa Montanaro, "The Solutions Expert," is Principal of LM Organizing Solutions, LLC, a professional services firm created in 2002 that offers professional organizing, business and life coaching, and motivational speaking to individuals and organizations. Lisa publishes the monthly "DECIDE® to be Organized" e-zine for the general public, and "Next Level Business Success" e-zine for professional organizers and entrepreneurs. Subscribe today at www.LMOrganizingSolutions.com. Lisa also publishes the DECIDE® to be Organized blog at www.DecideToBeOrganized.com. Through LMOS, Lisa helps people deal with the issues that block personal and professional change and growth. To explore how LMOS can improve your home or work environment, or help take your business to the next level, contact Lisa at (845) 988-0183 or by e-mail at Lisa@LMOrganizingSolutions.com.If you are an entrepreneur that provides a service, chances are you use a client agreement (if you do not, please reconsider!). And if the service you provide is of a confidential nature, such as professional organizing, your agreement most likely contains a confidentiality clause (if it doesn't, consider adding one!). But what confidential information are you actually protecting? And how far does that protection extend? If you are unsure, then the confidentiality clause is essentially meaningless. If you don't fully understand its weight and coverage, how will your client? Will a court or government body be able to ascertain the full meaning and scope of the confidentiality clause when asked to issue an interpretation of the confidentiality clause's coverage? How will it play out if the party that drafted the clause can't provide relevant information as to its scope and intention? As a former practicing attorney that has seen her share of confidentiality clauses, I can assure you that the importance of crafting a meaningful, powerful, but accurate and realistic confidentiality clause is vitally important to your business. Why include a confidentiality clause in your client agreement? Let's first look at why you would want to include a confidentiality clause in the first place. A confidentiality clause provides a safe environment for your client and promotes trust. Your client wants to know that he or she (or "it" if you are working with an organization) can fully trust you with confidential, personal, financial or proprietary information. A confidentiality clause demonstrates to the client that you are a true professional, willing to keep certain information to yourself and not disclose such information to others except under certain circumstances (more on the exceptions later). This allows the client to be fully present and disclose information freely which may result in a better, more open relationship, which in turn may lead to an increased ability to service the client. What can you keep confidential? There are some typical types of information that most confidentiality clauses cover. Many include confidentiality of financial information and trade secrets, promises not to release information to third parties without permission from client, no written or electronic information retained past the termination of relationship without the permission of client, no use of client information in marketing materials without permission of client, etc. In other words, it depends. You could guarantee that all information that you obtain during the scope of your work with the client be kept confidential. You could guarantee that any information that the client deems confidential will be kept from disclosure. But if you were to make that type of blanket guarantee, you would essentially be lying to your client. Why? Because it is up to the courts to determine the scope of the confidentiality clause if challenged. Why would a confidentiality clause ever be challenged? Let's look at some scenarios. Let's say you promise to keep all financial information confidential. Then you get served with a subpoena by a court or the Internal Revenue Service advising that you must appear in court or cooperate in an investigation. Let's take it a step further and assume that if you fail to cooperate, you can be held in contempt of court, fined, or worse, jailed. Now do you plan to stand by your blanket statement that ALL information of a confidential nature will be kept confidential? Doubtful. There are other scenarios that may result in you being called upon to disclose information. Child protective services investigations, elderly protective services investigations, drug enforcement investigations, spousal abuse investigations, tax and financial investigations, firearms investigations, etc. The list goes on. Are these scenarios common? Not typically. But that doesn't mean they may not arise. If they do, you need to be prepared for the fact that the confidentiality clause will most likely not be a match for the court or government agency's stronger need for the information you possess. Do entrepreneurs have immunity against disclosure of confidential information? Some entrepreneurs say they will try to keep confidentiality by arguing that they have a certain type of immunity under the law. If you are a lawyer, doctor, priest, therapist, or other professional that is covered by such an immunity, then by all means, go ahead and assert it. But the average entrepreneur, and professional organizers specifically, do not have a recognized immunity under the law. Therefore, a court would most definitely overrule any immunity you try to assert and order you to disclose any and all information in order to fully cooperate. How do you assure confidentiality in a way that is meaningful but allows for the fact that you may be called upon to answer to a higher authority? Be careful not to draft an overly broad confidentiality statement or you will give your client a false sense of security. You can only guarantee confidentiality up to the point when disclosure is required by law or subpoena. So why not just say that? Put clear language in your actual confidentiality clause that explains when disclosure is warranted. That way, the client is aware that you have every intention of protecting confidentiality, but that if you are issued a lawful subpoena and required to disclose, you will obey the law and cooperate. (By the way, when I refer to a "higher authority" in this context, I don't mean God, although you may feel a moral obligation to disclose is just as strong, if not stronger, than a legal one. If so, then you can envision yet another means for disclosure and breach of the confidentiality clause if you will disclose for moral reasons and not just legal ones.) Where does that leave you and your client if you disclose based on a proper investigation and lawful subpoena? Disclosure would probably not endear you to the client. However, that would be the lesser of two evils given that the alternative may be financial ruin or jail time. Can your client sue you for breach of contract for violation of the confidentiality clause? Sure. Anybody can sue anybody over anything at any time. But you would have a pretty airtight defense to get the case dismissed given that your disclosure was court ordered. Plus, you may just sleep better at night if your disclosure helps remedy an unlawful situation, prevent a crime, or save a person. The information provided in this article is not intended to be legal advice, but merely conveys general information related to legal issues commonly encountered. Copyright © 2010 Lisa Montanaro of LM Organizing Solutions, LLC. You can, as long as you use this complete statement: Copyright 2009. Lisa Montanaro is a Productivity Consultant, Success Coach, Business Strategist, Speaker and Author who helps people live successful and passionate lives, and operate productive and profitable businesses. Lisa publishes the monthly "DECIDE® to be Organized" e-zine for success-minded individuals, and "Next Level Business Success" e-zine for entrepreneurs. Subscribe today at www.LMOrganizingSolutions.com. Lisa is the author of The Ultimate Life Organizer: An Interactive Guide to a Simpler, Less Stressful & More Organized Life, published by Peter Pauper Press. Lisa also publishes the DECIDE® to be Organized blog at www.DecideToBeOrganized.com. Through her work, Lisa helps people deal with the issues that block personal and professional change and growth. To explore how Lisa can help take your business to the next level, contact Lisa at (845) 988-0183 or by e-mail at Lisa@LMOrganizingSolutions.com. I recently had the pleasure of conducting a teleclass on creating multiple streams of income for a service-based business. The participants were made up of several different types of entrepreneurs who all had one thing in common -- the awareness that having multiple streams of income is a sound business decision. Many of my business coaching clients, whether they are professional organizers, redesigners, home stagers, coaches, or any other type of entrepreneur, know how important it is to have multiple streams of income in their business. But knowing that something is a smart business move and actually doing it are two different things! I try to help my clients m ove from "knowing" to "doing" by assisting them with taking action. So, grab your business umbrella because it's raining streams of income! Why Create and Offer Multiple Streams of Income? Before you can take action, it is often extremely useful to figure out the "why" behind the actions. Creating and offering multiple streams of income for a service-based business helps you build a business with less work by taking your core business expertise and delivering it in multiple ways. You do the work once, repurpose it, and then keep using it and benefiting from it. This is often referred to as "leveraging" your content and expertise. Consider ways that you can move from delivering your content from 1 to 1, to 1 to many. Also, by offering options at several price points, you are able to reach a wider audience and assist more people. What Kinds of Multiple Streams of Income Can You Offer? Think of your business as an umbrella that has divisions underneath it. There are multiple ways to package your information, content and expertise. Think broadly! You can offer different types of services, products, and programs. Your services can be delivered on site and in person, or via telephone or Skype. You can offer services to just one client at a time, or groups of individuals. You can price your services by project or by package. The sky is the limit. With the invention of newer and better technology tools, service offerings will continue to expand. For products, listen to your prospects and clients. What do people keep asking you for? What could you create and offer that would solve some of your client's problems, while allowing you to have a product that provides passive income? There are audio and video programs (CDs, MP3s, video, etc. ), and print materials of all kind (e-books, tips booklets, White Papers, special reports, books, etc.). Think of what your clients and prospects need, and then provide them with the content in numerous ways. This is especially important if your clients are do-it-yourself kind of people and want to access your expertise on their own time. For programs, use your imagination! There are teleclasses, webinars, group coaching programs, mastermind groups, boot camps, retreats, mentoring programs, training and certification programs, and membership continuity programs. The list is endless and grows every day as clever entrepreneurs come up with new ways to package their content and expertise. What if I am Not Ready to Create Multiple Streams of Income? Even if you are not ready to create your own multiple streams of income, you can become an affiliate of other business owners’ programs, services and products. This allows you to provide a wide range of offers to your prospects and clients, and receive passive income for introducing them to fantastic offers that you believe are in their best interest. It is a win-win for all involved: you, the business that you are an affiliate for, and your client. How Can I Take Multiple Streams of Income a Step Further? If you want to take it a step further, you can create your own affiliate program once you have several streams of income. Don't be close minded and think, "But then I have to pay my affiliates a portion of my income." Yes, you do, but they deserve it as they brought you the sale in the first place! Take it from someone that has an affiliate program – I love nothing more than knowing I have "sales representatives" out there letting their clients know about my great services, products and programs. I smile every time I pay out an affiliate commission! Coaching Challenge: Look at your business a s an umbrella and figure out what natural streams of income fall under it. Choose one income stream this summer and create a service, product, or program that you can offer to your clients in order to leverage your content, and provide them with another way to access your expertise! Copyright © 2011 Lisa Montanaro of LM Organizing Solutions, LLC. You can, as long as you use this complete statement: Copyright 2011. Lisa Montanaro is a Productivity Consultant, Success Coach, Business Strategist, Speaker and Author who helps people live successful and passionate lives, and operate productive and profitable businesses. Lisa publishes the monthly "DECIDE® to be Organized" e-zine for success-minded individuals, and "Next Level Business Success" e-zine for entrepreneurs. Subscribe today at www.LMOrganizingSolutions.com. Lisa is the author of The Ultimate Life Organizer: An Interactive Guide to a Simpler, Less Stressful & More Organized Life, published by Peter Pauper Press. Lisa also publishes the DECIDE® to be Organized blog at www.DecideToBeOrganized.com. Through her work, Lisa helps people deal with the issues that block personal and professional change and growth. To explore how Lisa can help take your business to the next level, contact Lisa at (845) 988-0183 or by e-mail at Lisa@LMOrganizingSolutions.com. As summer is "off-peak" for many businesses, it couldn't be a better time to engage in some business building activities. If business is slow, don’t fret! Use this time wisely to gear up for the fall rush. Change your mindset and look at the slow summer time as an opportunity to reinvest in your business. If you have funds set aside for slow periods, good for you. If not, then all you have on your side now is time. This may be the perfect time to do some of the business-building activities that you never have the time to do when you are too busy working in the business. This may also be a golden opportunity for professional development, reflection, and brainstorming. If time is on your side this summer, here are some ways to reinvest in your business. They will stimulate and rejuvenate your business. Come fall, you will be ready to prosper and succeed with a new and improved business. You can, as long as you use this complete statement: Copyright 2008. Lisa Montanaro is a Productivity Consultant, Success Coach, Business Strategist, Speaker and Author who helps people live successful and passionate lives, and operate productive and profitable businesses. Lisa publishes the monthly "DECIDE® to be Organized" e-zine for success-minded individuals, and "Next Level Business Success" e-zine for entrepreneurs. Subscribe today at www.LMOrganizingSolutions.com. Lisa is the author of The Ultimate Life Organizer: An Interactive Guide to a Simpler, Less Stressful & More Organized Life, published by Peter Pauper Press. Lisa also publishes the DECIDE® to be Organized blog at www.DecideToBeOrganized.com. Through her work, Lisa helps people deal with the issues that block personal and professional change and growth. To explore how Lisa can help take your business to the next level, contact Lisa at (845) 988-0183 or by e-mail at Lisa@LMOrganizingSolutions.com. I'm hearing a lot these days about business reinvention. And it certainly seems like a great idea. But I think that a complete business overhaul is not only unjustified much of the time, but can be a risky move. So instead, I'd like to propose the idea of a business "remodel", which is more along the lines of a home remodel. When you remodel your home, you generally keep the existing structure and foundation. The changes are distinct for sure, but do not involve knocking down your entire home. Rather, the remodel may involve adding an addition, repainting a room, finishing a basement, etc. Likewise, you can remodel your business in distinct and powerful ways that cause a huge shift in your delivery of services, income stream, target market, or visibility as an expert. But a business remodel needs to be justified, strategic, and executed in such a way that the remodel doesn’t cause too much turmoil in your business. When you remodel a home, for example, it needs to be done in a way that causes the least disruption to your living environment. Yes, you are willing to suffer some inconvenience in the short run knowing you will wind up with a beautiful newly remodeled home. But you wouldn't plan a remodel that forces you to live in absolute chaos unless you can move out during the construction and find another place to live. Easier said than done! With your business, you can't necessarily find a new business "home" while conducting a business remodel because you still need cash flow. Sure, there are exceptions for those business owners that saved a ton of money to fund a remodel, but even in that case, it would mean dropping out of the business for a temporary period, which is not going to leave you top of mind with your target market. So what is the best way to approach a business remodel and what might it include? Here are some tips and guidance. You can, as long as you use this complete statement: Copyright 2011. Lisa Montanaro, "The Solutions Expert," is Principal of LM Organizing Solutions, LLC, a professional services firm created in 2002 that offers professional organizing, business and life coaching, and motivational speaking to individuals and organizations. Lisa publishes the monthly "DECIDE® to be Organized" e-zine for the general public, and "Next Level Business Success" e-zine for professional organizers and entrepreneurs. Subscribe today at www.LMOrganizingSolutions.com. Lisa also publishes the DECIDE® to be Organized blog at www.DecideToBeOrganized.com. Through LMOS, Lisa helps people deal with the issues that block personal and professional change and growth. To explore how LMOS can improve your home or work environment, or help take your business to the next level, contact Lisa at (845) 988-0183 or by e-mail at Lisa@LMOrganizingSolutions.com.Anyone that knows me (or even just meets me) can tell that I love my business and work really hard. But I'm not only a passionate entrepreneur, I am a multi-passionate person! One of the worst mistakes I've ever made when I first became an entrepreneur was to "compartmentalize" my life. It dawned on me a few years ago that I don't have a "personal life" and a "professional life," but simply A LIFE. Consequently, I do things when they feel right, which might include writing an article or taking care of client work on a Saturday or Sunday morning, and going on a bike ride, taking a yoga class or heading out with my dogs on a hike on a Wednesday afternoon. In fact, flexibility and freedom are part of what makes being self-employed so glorious. And yet, so many entrepreneurs continue to separate their personal and professional lives in ways that actually work to avoid an y semblance of balance. If a strict bifurcation of personal and professional is working for you, great. But ask yourself if it is truly working for you. Are you too regimented in your scheduling of work versus personal endeavors? Does your personal life always get short shifted at the expense of your professional life? Examine whether you really feel balanced. If not, something has got to change. Mix things up and see how it feels. Try to tap into your natural energy flow and rhythm so that you can do tasks when you are in top form, and not when you are "supposed" to. I realize this is easier said than done, and it is a constant battle to have the freedom and flexibility so many entrepreneurs crave. We still have to function within the 9-5 world we live in, and be able to serve our clients at a time when it is convenient for them. But at least try to move away from the compartmentalization that can cause you to overwork and resent your business. If you are starting to feel burned out, perhaps you need to work in more time to cultivate your hobbies and passions. Not only will you feel rejuvenated, but you may actually be a better and more well-rounded entrepreneur because of your non-work related activities. For example, I love to travel and explore new cultures. This could be viewed as only a personal activity. And yet, my travel and exploration of other cultures infiltrates my work in surprising and refreshing ways. I sometimes find myself "studying" the ways of other cultures and comparing them to Americans in terms of productivity, work-life balance, attitudes on business, goal setting, etc. This makes me a better productivity consultant, success coach, business strategist, speaker and writer for sure! Even a simple personal activity like taking a hike or bike ride can fill me with wonderful new ideas to write or s peak about, help me work through a client issue that I am helping him or her with, or clear my mind to make space to create new programs and products. The bottom line is that we all have to find that unique balance that makes the most sense for us. But I am proposing less of a balance in terms of this versus that, and more of a free flow of ideas, activities and use of time that feels authentic and allows you to be the best entrepreneur you can be. Because in the end, isn't that what we all want? Copyright © 2012 Lisa Montanaro of LM Organizing Solutions, LLC. Recycle – Junk mail that is not confidential. Act – Bills to pay, invitations to RSVP to, and forms to fill out, etc. File – Vital documents that must be kept long term (only 20% of paper needs to be filed!). Toss – If you unfortunately do not have paper recycling in your area. Shred – Anything with financial or confidential information on it. Designate a spot for your mail. If there is no “mailbox” in the house, you will “deliver” it to a different spot each time, or in a location that may not be best suited to paper flow (for example, the dining room table!). Keep the recycling bin, garbage, shredder, and calendar/planner nearby to immediately be able to take action. Whatever is brought in the house should be pre-sorted by recipient, category or any system that makes sense for your household. For a large household, consider separate mail slots per person. Evaluate whether you want to continue to receive magazines and newspapers that you are not regularly reading. Cancel subscriptions, rotate them, or share with a friend or neighbor. Get in the habit of cutting out only those articles you know you will refer to again, and recycling the magazine itself. Set up those articles by subject matter in your home filing system. Start by throwing out the piles of unread junk mail and catalogs. If you have a home office, use it! If not, set up a Home Information Center. When you have a high functioning paper management system, you will be motivated to actually get the work done and keep it organized. If you have good systems in place, you will be able to find what you need more easily and be able to do the mundane tasks, such as bill paying with less stress! Now, go find your RAFT and climb in. Happy sailing… Copyright © 2009 Lisa Montanaro of LM Organizing Solutions, LLC. If you are an entrepreneur that provides a service, chances are you use a client agreement (if you do not, please reconsider!). And if the service you provide is of a confidential nature, such as professional organizing, your agreement most likely contains a confidentiality clause (if it doesn’t, consider adding one!). But what confidential information are you actually protecting? And how far does that protection extend? If you are unsure, then the confidentiality clause is essentially meaningless. If you don’t fully understand its weight and coverage, how will your client? Will a court or government body be able to ascertain the full meaning and scope of the confidentiality clause when asked to issue an interpretation of the confidentiality clause’s coverage? How will it play out if the party that drafted the clause can’t provide relevant information as to its scope and intention? As a former practicing attorney that has seen her share of confidentiality clauses, I can assure you that the importance of crafting a meaningful, powerful, but accurate and realistic confidentiality clause is vitally important to your business. Why include a confidentiality clause in your client agreement? Let’s first look at why you would want to include a confidentiality clause in the first place. A confidentiality clause provides a safe environment for your client and promotes trust. Your client wants to know that he or she (or “it” if you are working with an organization) can fully trust you with confidential, personal, financial or proprietary information. A confidentiality clause demonstrates to the client that you are a true professional, willing to keep certain information to yourself and not disclose such information to others except under certain circumstances (more on the exceptions later). This allows the client to be fully present and disclose information freely which may result in a better, more open relationship, which in turn may lead to an increased ability to service the client. What can you keep confidential? There are some typical types of information that most confidentiality clauses cover. Many include confidentiality of financial information and trade secrets, promises not to release information to third parties without permission from client, no written or electronic information retained past the termination of relationship without the permission of client, no use of client information in marketing materials without permission of client, etc. In other words, it depends. You could guarantee that all information that you obtain during the scope of your work with the client be kept confidential. You could guarantee that any information that the client deems confidential will be kept from disclosure. But if you were to make that type of blanket guarantee, you would essentially be lying to your client. Why? Because it is up to the courts to determine the scope of the confidentiality clause if challenged. Why would a confidentiality clause ever be challenged? Let’s look at some scenarios. Let’s say you promise to keep all financial information confidential. Then you get served with a subpoena by a court or the Internal Revenue Service advising that you must appear in court or cooperate in an investigation. Let’s take it a step further and assume that if you fail to cooperate, you can be held in contempt of court, fined, or worse, jailed. Now do you plan to stand by your blanket statement that ALL information of a confidential nature will be kept confidential? Doubtful. There are other scenarios that may result in you being called upon to disclose information. Child protective services investigations, elderly protective services investigations, drug enforcement investigations, spousal abuse investigations, tax and financial investigations, firearms investigations, etc. The list goes on. Are these scenarios common? Not typically. But that doesn’t mean they may not arise. If they do, you need to be prepared for the fact that the confidentiality clause will most likely not be a match for the court or government agency’s stronger need for the information you possess. Do entrepreneurs have immunity against disclosure of confidential information? Some entrepreneurs say they will try to keep confidentiality by arguing that they have a certain type of immunity under the law. If you are a lawyer, doctor, priest, therapist, or other professional that is covered by such an immunity, then by all means, go ahead and assert it. But the average entrepreneur, and professional organizers specifically, do not have a recognized immunity under the law. Therefore, a court would most definitely overrule any immunity you try to assert and order you to disclose any and all information in order to fully cooperate. How do you assure confidentiality in a way that is meaningful but allows for the fact that you may be called upon to answer to a higher authority? Where does that leave you and your client if you disclose based on a proper investigation and lawful subpoena? Disclosure would probably not endear you to the client. However, that would be the lesser of two evils given that the alternative may be financial ruin or jail time. Can your client sue you for breach of contract for violation of the confidentiality clause? Sure. Anybody can sue anybody over anything at any time. But you would have a pretty airtight defense to get the case dismissed given that your disclosure was court ordered. Plus, you may just sleep better at night if your disclosure helps remedy an unlawful situation, prevent a crime, or save a person. The information provided in this article is not intended to be legal advice, but merely conveys general information related to legal issues commonly encountered. I recently had the pleasure of conducting a teleclass on creating multiple streams of income for a service-based business. The participants were made up of several different types of entrepreneurs who all had one thing in common — the awareness that having multiple streams of income is a sound business decision. Many of my business coaching clients, whether they are professional organizers, redesigners, home stagers, coaches, or any other type of entrepreneur, know how important it is to have multiple streams of income in their business. But knowing that something is a smart business move and actually doing it are two different things! I try to help my clients m ove from “knowing” to “doing” by assisting them with taking action. So, grab your business umbrella because it’s raining streams of income! Why Create and Offer Multiple Streams of Income? Before you can take action, it is often extremely useful to figure out the “why” behind the actions. Creating and offering multiple streams of income for a service-based business helps you build a business with less work by taking your core business expertise and delivering it in multiple ways. You do the work once, repurpose it, and then keep using it and benefiting from it. This is often referred to as “leveraging” your content and expertise. Consider ways that you can move from delivering your content from 1 to 1, to 1 to many. Also, by offering options at several price points, you are able to reach a wider audience and assist more people. What Kinds of Multiple Streams of Income Can You Offer? Think of your business as an umbrella that has divisions underneath it. There are multiple ways to package your information, content and expertise. Think broadly! 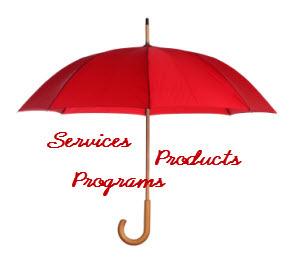 You can offer different types of services, products, and programs. Your services can be delivered on site and in person, or via telephone or Skype. You can offer services to just one client at a time, or groups of individuals. You can price your services by project or by package. The sky is the limit. With the invention of newer and better technology tools, service offerings will continue to expand. For products, listen to your prospects and clients. What do people keep asking you for? What could you create and offer that would solve some of your client’s problems, while allowing you to have a product that provides passive income? There are audio and video programs (CDs, MP3s, video, etc. ), and print materials of all kind (e-books, tips booklets, White Papers, special reports, books, etc.). Think of what your clients and prospects need, and then provide them with the content in numerous ways. This is especially important if your clients are do-it-yourself kind of people and want to access your expertise on their own time. For programs, use your imagination! There are teleclasses, webinars, group coaching programs, mastermind groups, boot camps, retreats, mentoring programs, training and certification programs, and membership continuity programs. The list is endless and grows every day as clever entrepreneurs come up with new ways to package their content and expertise. What if I am Not Ready to Create Multiple Streams of Income? Even if you are not ready to create your own multiple streams of income, you can become an affiliate of other business owners’ programs, services and products. This allows you to provide a wide range of offers to your prospects and clients, and receive passive income for introducing them to fantastic offers that you believe are in their best interest. It is a win-win for all involved: you, the business that you are an affiliate for, and your client. How Can I Take Multiple Streams of Income a Step Further? If you want to take it a step further, you can create your own affiliate program once you have several streams of income. Don’t be close minded and think, “But then I have to pay my affiliates a portion of my income.” Yes, you do, but they deserve it as they brought you the sale in the first place! Take it from someone that has an affiliate program – I love nothing more than knowing I have “sales representatives” out there letting their clients know about my great services, products and programs. I smile every time I pay out an affiliate commission! Coaching Challenge: Look at your business a s an umbrella and figure out what natural streams of income fall under it. Choose one income stream this summer and create a service, product, or program that you can offer to your clients in order to leverage your content, and provide them with another way to access your expertise! Anyone that knows me (or even just meets me) can tell that I love my business and work really hard. But I’m not only a passionate entrepreneur, I am a multi-passionate person! One of the worst mistakes I’ve ever made when I first became an entrepreneur was to “compartmentalize” my life. It dawned on me a few years ago that I don’t have a “personal life” and a “professional life,” but simply A LIFE. Consequently, I do things when they feel right, which might include writing an article or taking care of client work on a Saturday or Sunday morning, and going on a bike ride, taking a yoga class or heading out with my dogs on a hike on a Wednesday afternoon. In fact, flexibility and freedom are part of what makes being self-employed so glorious. And yet, so many entrepreneurs continue to separate their personal and professional lives in ways that actually work to avoid an y semblance of balance. If a strict bifurcation of personal and professional is working for you, great. But ask yourself if it is truly working for you. Are you too regimented in your scheduling of work versus personal endeavors? Does your personal life always get short shifted at the expense of your professional life? Examine whether you really feel balanced. If not, something has got to change. Mix things up and see how it feels. Try to tap into your natural energy flow and rhythm so that you can do tasks when you are in top form, and not when you are “supposed” to. I realize this is easier said than done, and it is a constant battle to have the freedom and flexibility so many entrepreneurs crave. We still have to function within the 9-5 world we live in, and be able to serve our clients at a time when it is convenient for them. But at least try to move away from the compartmentalization that can cause you to overwork and resent your business. If you are starting to feel burned out, perhaps you need to work in more time to cultivate your hobbies and passions. Not only will you feel rejuvenated, but you may actually be a better and more well-rounded entrepreneur because of your non-work related activities. For example, I love to travel and explore new cultures. This could be viewed as only a personal activity. And yet, my travel and exploration of other cultures infiltrates my work in surprising and refreshing ways. I sometimes find myself “studying” the ways of other cultures and comparing them to Americans in terms of productivity, work-life balance, attitudes on business, goal setting, etc. This makes me a better productivity consultant, success coach, business strategist, speaker and writer for sure! Even a simple personal activity like taking a hike or bike ride can fill me with wonderful new ideas to write or s peak about, help me work through a client issue that I am helping him or her with, or clear my mind to make space to create new programs and products. The bottom line is that we all have to find that unique balance that makes the most sense for us. But I am proposing less of a balance in terms of this versus that, and more of a free flow of ideas, activities and use of time that feels authentic and allows you to be the best entrepreneur you can be. Because in the end, isn’t that what we all want? Copyright © 2012 Lisa Montanaro of LM Organizing Solutions, LLC. Paper. It should be a benign part of our lives. It means no harm, really. But somehow, when it piles up and has a paper party with its friends, it becomes dreaded clutter! What to do? When you have a high functioning paper management system, you will be motivated to actually get the work done and keep it organized. If you have good systems in place, you will be able to find what you need more easily and be able to do the mundane tasks, such as bill paying with less stress!